Whatever their view on the economic prospects, CEOs agree that the survival of their businesses is the first priority in a downturn. For most, this means ensuring that the balance sheet is strong: that the business is adequately capitalized and that the company is generating the cash needed to meet debt covenants. Here are top CEOs’ tips on ensuring that your business is operating efficiently. In a growth economy, businesses perceived as lazy and inefficient face pressure to return capital to shareholders. In a downturn, share buybacks and special dividends swiftly dry up as companies ensure that they have sufficient capital to support their operations. “Cash is king so keep the balance sheet strong," advises Ian Coull, CEO of property group Segro. He adds, “You will then have the fire power to take advantage when things settle down." Barclays CEO John Varley, however, believes in keeping the balance sheet as efficient as possible, even in a downturn. Barclays’ £4.5bn fundraising in 2008 was criticized by some analysts who believed it would be insufficient, but Varley told us: “As an organization, you have to form a point of view about how much capital you need to run your business. You have to be prudent in that and you have to be analytical. You have to determine that number and that’s what you’ve got to have." Critical to operating within capital constraints is efficient cash generation, as Bajaj Auto chairman Rahul Bajaj explains. “In a downturn, cash in particular is king and a tight focus on operating efficiency and working capital is necessary," he says. “In a growing business, sometimes operating efficiency (costs, productivity) and working capital take a back seat and businesses bloat up. This can hurt in a downturn. However, if the business is always run lean with continuous focus on increasing efficiency, then no special effort is required in a downturn." In tough times the temptation, exaggerated by the feverous sentiment of the markets, is to cut deep and early, a move often presented as “decisive and brave". 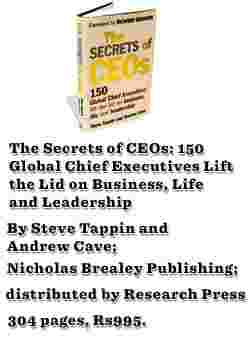 However, CEOs need to take great care not to be short-sighted. United Utilities CEO Philip Green thinks that “leadership is about the tough prioritization calls. Yes, you have to cut costs but what you consciously do not cut is just as important," he says. “We will continue to invest in our priorities—especially talent, training, and climate change." Overall, you are best placed to exploit the recovery when it happens by keeping focused on the long term, even while addressing the immediate, as Alan Rosling, executive director of Tata Sons, summarizes. “Leaders need to balance the immediate issues, which will lead to greater caution, cost reduction and a more careful risk profile, with the need to maintain the long term," he says. Investment in brands, training and development of people, technology and innovation, and the opening of new markets needs to continue even while the immediate performance of the business is maintained." Archie Norman, the former Asda chief executive who now runs private equity firm Aurigo Management, believes it’s critical to clear the decks straight away. “You must try to avoid continuous surprise," he says, referring to the multiple attempts at emergency capital by some banks. “It’s much better to try to ‘panic early’: declare your losses, get any luggage over board, and get your people facing the bad news." HBOS CEO Andy Hornby also says that ensuring operations are really slick is critical during turbulent times. CEOs should “surround themselves with people who don’t mind having to take tough decisions," he states. “From the finance director to divisional chief executives, people should be comfortable with saying ‘no’. You need to get people around you who have the strength to say no when things are not right." Equally, some of your high fliers will need more attention in a downturn. Warns Ian Coull: “There needs to be more hands-on activity as many of the high fliers will not have experienced it before and they could panic." Archie Norman agrees: “You have to get people motivated and facing the recession. They must not feel bad that there’s a global recession—it’s not their fault!" You need a highly capable company coming out of the recession so it is vital, despite short-term pressure, to continue to develop your people. “Smart guys’ careers can’t stop just because there’s a recession," states one prominent former CEO. “I’m not a sailor," says Andy Hornby, “but one of the things that everybody has said to me is that capital markets are like the tide. You have got to catch the tide. Once it has gone out, you are left high and dry." For HBOS, that meant organizing a £4bn rights issue to give the group the capital it needed to repair balance sheets and meet liabilities. The HBOS rights issue was fraught, but it was fully underwritten and raised the money the company required. Moreover, Hornby is certain that if he had delayed even by six weeks, that window could have closed. Managing capital in a constrained market requires CEOs to take advantage of limited opportunities. Pulling off such deals requires a very responsive business. “It is really important when doing something like this that your lines of communication are short and effective," says John Varley. He has been on the bank’s management committee with Barclays’ chief executive of investment banking Bob Diamond for more than ten years and says that they had “continuous and effective" contact with each other during the company’s global capital-raising activities. “Bob and I know how each other work," he says. “That kind of shorthand that you get from knowing each other and trusting each other is very valuable in the intense period of activity around a big transaction like this." Good market and customer intelligence and a dynamic response are also vital. Cable and Wireless’s John Pluthero says that in January 2008 his team cut the plan for the year again so that the company could hit its targets through cost management alone. They also put in place extra early warning systems, looking into the business’s pipeline to see if customers were canceling or deferring projects. “Every week we review whether we need to execute our back-up plan," he says. “It’s about managing in real time and having the real systems in place to be getting a real steer on the dynamics all the time." Mark Tucker, CEO, Prudential, is insistent that “often a downturn brings opportunity—that’s why boldness becomes vital". He adds: “There needs to be a preparedness to take these opportunities. The difference at this juncture between good and mediocre is that the mediocre will tend to be overcautious or reckless, rather than bold and decisive." Of course, leading through a downturn does not feel like business as usual after a long period of broadly benign economic conditions. However, many CEOs believe you have to just accept the economic reality as a fact for the foreseeable future and look to grow market share and competitive advantage with the same intensity as pre-downturn, and that economic turmoil will create unique opportunities. This assertion is powerfully illustrated in the financial services industry—even while many players are reeling. Says Bob Diamond at Barclays: “Most foreign banks have not succeeded when they’ve entered the US market. However, we entered 2008 with six or seven of the key players in the US domestic capital markets pulling back. It’s counter-trend to be investing in the US, but we see an opportunity to move into the top three or top five in all the areas that are important to us and we’re already seeing progress." Liu Jiren, chairman and CEO of Neusoft, advocates a careful review of how you can take advantage of the change in circumstances across your organization, saying companies should consider their ways of operating and search for new business models that may help them focus on exploring long-term industry possibilities. “During any economic recession, it is much easier to complete a buyout or merger at a lower price than usual," he says. “Consequently, in addition to cost-effective possession of the brands, customers, and technical resources of the companies that are purchased, buyers can beat their competitors and move up in the industry rankings through resource restructuring. 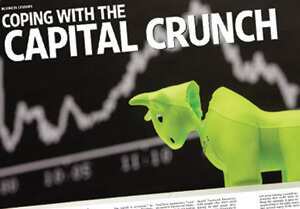 In a sense, we may say that any economic downturn could be a strategic time for enterprises to invest for the future." Even as the recession appears to globalize, it seems clear that there will be great opportunities for organic growth, in particular in emerging markets. In Alan Rosling’s view: “The emerging world will become relatively more influential as a result of a slowing in the developed world. Good Western companies will continue to grow their businesses in emerging markets, while emerging-market companies will gain relative position." As in the event of any major shock to the business, downturns put the CEO right in the spotlight. Experienced CEOs offer the following advice. It is very easy to be knocked by a tough economic climate. Guardian Media Group CEO Carolyn McCall is clear: “For me, the most important thing is the posture and language of my top team. It’s very easy for directors to seem beleaguered in a downturn and that is very dangerous. Leaders need to bring energy and belief to their teams." The bottom line is that all your people need reassurance during tough times. CEOs stressed to us the paramount importance of communicating clearly and frequently with your people, so that they are reassured and can reassure your customers. One leading CEO sent an email to his whole business explaining the need for a rights issue and by lunchtime he had had 2,000 responses! Another confided: “People will follow you through almost any troubles if they know the business is facing reality and has a roadmap ultimately to get to a good place in the future." It’s in times of downturn that you can make the right decision for the medium or long term and still watch your stock price plummet by 60 percent. This is where it is a lonely personal burden to keep an eye on the long term. Being CEO at these times is not a popularity contest and analysts and commentators have little idea of what’s going to happen to the economy. “The reality is you have to go more with your gut," one FTSE100 CEO told us, “because the markets and analysts don’t give you credit for doing the right things for business in the long term at this stage of the cycle." In tough times, you must be flexible and avoid dogmatically sticking to out-of-date plans. Equally, however, you come under harsh financial performance pressures and it can be tempting to do business that does not fit with your long-term strategy. You must resist. “During tough market conditions we need to make sure we stick to our principles of not writing business for a short-term gain and maintain our longer-term view and financial discipline, and do not succumb to the temptation to please the market with robust sales growth at the expense of profitability," underlined Mark Tucker. Ultimately, you must not be distracted by the market and must continue to grind out great business every day. Discipline also requires you to safeguard the assets you will need to capitalize on during the economic recovery. “Of course you have to get the costs down…but if you cut too hard and too fast and too near the bone, you cannot come out of the crunch fast enough," says Carolyn McCall. “When palpable opportunities reappear, you won’t have the resource to take advantage."